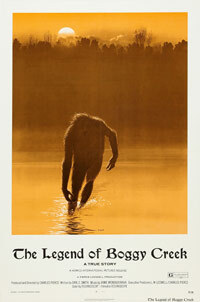 The Legend of Boggy Creek was the directorial debut of the late Charles B. Pierce (The Town That Dreaded Sundown) who put aside a career in advertising to pursue indie filmmaking. A resident of Texarkana in the early 1970s, Pierce was drawn to the sensational newspaper reports describing a hairy, bigfoot-like creature which haunted the creeks near Fouke, Arkansas. Hoping to capitalize on the frenzy, Pierce borrowed some money, got a camera, and set out to make a movie based on the alleged beast. The result was a truly frightening film (at the time) which became a bona fide box office sensation. The success was remarkable, but not completely surprising to Pierce who knew he had something special judging from its premiere at an old Texarkana theater in August 1972. Initially turned down by Hollywood distributors, Pierce rented the theater, cleaned it up, and began showing the movie. In no time there were lines of people five blocks long. After Howco International finally picked it up for distribution, the film went on to gross more than $22 million as it played for years in the theater and drive-in circuit, and on television. Not only was The Legend of Boggy Creek successful in its own time and has now become a cult classic, but it also has bragging rights for being one of the first horror films shot in a docudrama style. Whether intentional or not, the film's gritty, piecemeal production and first-person accounts impart a sense of realism which makes the incredible story seem all the more believable. This technique, common today, was way ahead of its time and is a major reason why this cult gem still endures despite any shortcomings. Modern filmmakers, such as the directors of Blair Witch Project, have cited Pierce's pioneering work as a huge influence on their own movie making. In a 1999 interview with The Tulsa World, Blair Witch Project co-director Daniel Myrick was quoted as saying: "We just wanted to make a movie that tapped into the primal fear generated by the fact-or-fiction format, like [The] Legend of Boggy Creek." The Legend of Boggy Creek still stands as an import and entertaining film, as it continues to thrill monster lovers, inspire cryptozoologists, and influence young filmmakers alike nearly 40 years later.